Tavern Tiho Noći is popular tavern in capital located at No 13-15 Kralja Petra Street, while the entrance is from restaurant Que Passa?. Tavern Tiho Noći provides you unusual entertainment, impeccable service, professional and friendly staff always ready to serve you. Waiters of tavern Tiho Noći are at the same time your best friends and shoulder to cry on. In tavern Tiho Noći you will always be in good mood. Relaxation is harmoniously combined with elegance which gives you unique experience. Interior is also pleasantly decorated and subordinated to your pleasure. Architectural concept of tavern Tiho Noći is such that there is no bad place to be and wherever you will always be in center of attention. Interior is designed with dark bricks and interesting colors of walls, where juncture of strict shapes and neutrality exudes with perfection. In this modern ambient with amazing acoustic you will undoubtedly spent most beautiful moments with family, friends and your dear ones, without spending big amount of money. 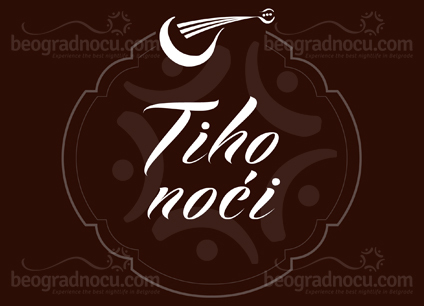 For your superb entertainment, tavern Tiho Noći is opened on Friday and Saturday from 10 pm to 4 am. In tavern Tiho Noći you can hear only great professionals play and mostly traditional music, but as you are used to this - everything, including music is subordinated to guests. Music is here to complete all your needs and makes you miss this tavern as soon as you leave it. Tavern Tiho Noći accommodates 120 people and guests are always in good mood and maximally satisfied with whole concept and service of this place.